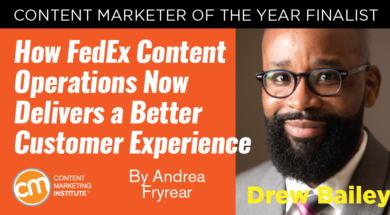 What kept good content marketers from delivering a better content experience for FedEx customers? Redundancies, overlaps, and a general lack of communication. Drew Bailey, Manager, Content Strategy, wanted to change that when he took the reins of content operations at FedEx Services. “My team’s job is enablement,” says Bailey. Creative problem-solving, a clear strategic road map, and some counter-intuitive steps helped Bailey’s team start to meet this goal, and earned him a nomination for the 2017 Content Marketer of the Year. Bailey, a professional with an IT and project management background, found no shortage of areas for improvement as he explored his new environment in the world of content strategy. To transition the process and technology responsibilities from the content creators to the strategy and curation team, he invested a significant amount of time listening to the voice of the customer. Assess. This phase includes a root-cause analysis to discover what really contributes to a disjointed customer experience. One customer, for example, received 13 unrelated emails each month from FedEx. The team wanted to determine why. Through careful evaluation of people, process, measurement, inputs, and technology, the team found small changes that could deliver immediate improvement. Notice how central the customer is in all the fields? Bailey says that is one of the biggest (and best) changes at FedEx. In the past, the go-to-market team would get requests for content centered on a new product or service being launched, and they’ve now flipped the paradigm. With seven regions around the globe creating content, redundancy was a major source of waste in the launch phase. Drew’s team developed a digital asset management platform and taxonomy to prevent creators from having to reproduce content that exists elsewhere. Launch. The launch phase standardized the process for planning and executing content. This new process incorporated checklists, editorial calendars, themes across the segments, as well as execution plans. Bailey led his team to establish workflows to visualize and monitor content from ideation to publication. Evaluate. The final phase established benchmark improvements and identified best practices specific to channels used. FedEx measures content by engagement and revenue produced by the targeted customer segment. Bailey’s team provided a measurement system that ensures consistent tracking across the teams at FedEx, and a campaign status dashboard and metrics using Adobe Analytics. The teams now use a closed-loop feedback process to share results with key stakeholders and drive continuous improvement across all of their content. Several of the FedEx content team’s channels have seen substantial benefits from this operationalized approach.Early in his tenure, Bailey heard CMI founder Joe Pulizzi speak at the 2016 TMSA Logistics Marketing & Sales Conference in Fort Lauderdale. Pulizzi challenged Bailey and other TMSA members to think about whether their email newsletters really serve their subscribers. Bailey realized FedEx’s emails did not. “I pitched a totally new approach to my management team,” he says. Management was on board, and even agreed to cease the newsletter for several months to make the pivot effectively. Prior to the new approach, FedEx had five agencies creating 80% new content for each monthly newsletter. The revenue derived from the newsletter was barely enough to break even. Now two agencies handle the newsletters, and 20% of the content is new. Approximately 80% is curated, turning the emails into a powerful amplification channel. Not only has the reboot reduced the cost associated with the newsletters, it also is delivering double-digit revenue increases from subscribers in the months since the pivot. The Larger Context of Content Strategy: GO! The email turnaround is a micro-example of a much larger change in how FedEx handles content. The new process has been dubbed GO! and extends from executive vision to tactical execution.The GO! process is a go-to-market strategy that centralizes content operations for U.S. marketing teams (and soon several international marketing regions). It clearly defines overall roles and responsibilities, creates a process for content and channel governance, creates a shared road map across all campaigns and channels, and provides a defined process for marking project requests. To ensure this process runs smoothly, every layer of the marketing organization participates. This increased communication and collaboration has been invaluable - allowing teams to deliver better, more consistent customer experiences and to hit business objectives. For instance, one team’s A-B test revealed that a simple image change delivered up to 30% increase in conversions. The regular GO! Channel meetings have enabled the teams to share their findings quickly with colleagues who could duplicate their results in their own work. Operationalizing Excellence. Putting in place the right tools and processes may not be the flashiest part of content marketing, but this FedEx success story proves that it’s a valuable one. By establishing lines of communication and removing complications, Bailey and his team are on their way to achieving content marketing excellence. TMSA Members: Make plans to attend Content Marketing World Sept. 5-8 in Cleveland, Ohio, to hear who wins Content Marketer of the Year 2017 and learn from industry experts so you may create an award-winning content marketing program yourself. And attend the CMWorld Automotive and Transportation Industry Lab. TMSA Members can register and use code BLOG100 to save $100. Original Source: Content Marketing Institute View Original Article here. Comments on "Content Success: How FedEx Delivers a Better Customer Experience"